This teaser solution originally appeared as part of a Friday File for the Irregulars on December 15. The ads are still running, this time under headlines like “Time to Bet the Farm”, so we’re taking another look, including my updated thoughts following the last quarterly report (I own this one), but most of the teaser solution commentary — and the ad — is unchanged from 12/15/17. “Here’s why it could jump 50% on earnings and double soon after that…. “That’s because the company’s low price point products appeal to the fastest growing demographic on the planet: millennials. “Unlike Amazon, which sells everything under the sun, this company has carefully targeted its market to teens, pre-teens and their parents—selling them must-have, in demand, fashionable items along with seasonal must-haves for Easter, Halloween, Christmas and more. “But time is running out on getting in on the ground floor here. Which has been trying to essentially ride the dollar store craze while also adding the old “fast fashion” secret sauce from the Target of the 1990s — the stores feature things that cost less than $5, and they focus on seasonal goodies and, well, fad and fashion-driven semi-disposable junk. Like fidget spinners and ugly Christmas sweaters. And it’s been working — they’re growing fast, they’re expanding the store count rapidly, and analysts see pretty dramatic earnings growth in the 20% neighborhood for as far as the eye can see… the only problem, really, is that they’re expensive. That’s not uncommon for fashionable retailers who are rapidly building out stores and showing dramatic top-line growth, such stocks often get expensive (remember Chipotle?) … and it works as long as it works, as long as those stores can keep getting added without hurting the same store sales growth. The big benefit for FIVE over the also-somewhat-fashion-driven and successful (but much larger) dollar stores like Dollar Tree or Dollar General is that they have a tiny store count — only about 600 stores now, probably adding 100 or more this coming year, that kind of buildout can create really stupendous top-line growth and cure a lot of ills when it comes to per-store performance… so when per-store performance is also really good, like it was last quarter for FIVE, the leverage for the stock price can be pretty dramatic. In a world that hates retail stocks still, despite the recent recovery of the sector, FIVE is appealing because of that growth: Store count growth, same store sales growth, and huge top-line revenue growth. It’s still tough to buy a stock like FIVE, because it has run so fast and is trading at a forward PE of about 32, but that growth rate makes it much more reasonable if you can stomach the fashion-driven hits and misses — I don’t know if I’d jump on the stock at all-time highs, but I wouldn’t argue against nibbling a little bit and hoping there’s a little letdown after the Christmas shopping. They don’t report earnings again until March, so things could quiet down for a bit if the market ever takes a little vacation from bullishness. Yes, I did end up buying a position in FIVE, both calls and equity, because of that combination of strong underlying growth and the expected large impact of the tax cuts on their income for 2018. It could be that the tax change alone might increase FIVE’s net income by as much as 20% over what it would otherwise have been. That, I theorized when I bought the shares, could bring the forward PE down from 32 to 27 or so. FIVE is generally lumped into the “dollar store” category, it’s the teen-focused retailer that sells most everything for under $5 and is heavily fad and fashion driven, with a jump in earnings last year from the fidget spinner craze and, more importantly to my investment thesis, a very small footprint that they’re aggressively expanding across the country. I bought shares starting back in December because of the two levers that I thought would be operating on their earnings growth: Taxes and Store growth. They are a major beneficiary of the corporate tax cut, since they’re entirely a US company and they paid a pretty high tax rate before January, and they are small enough, with only about 700 stores now, to grow dramatically in size before they run out of appealing new markets to enter. To give you some idea of the impact of rapid store growth on the top line, they had “comparable store sales” growth last quarter of about 3.2% (which was in the guidance range, though the number of transactions was down a bit because of the cold spring weather), but because they can open stores quite efficiently and get them up to speed fast, and because the store count is so small that they’re actually increasing the total store count by close to 5% each quarter, the actual total sales increased by 27%. On top of that, the lower tax rate helped them double earnings in the quarter, year over year. Of course, none of that was a huge surprise to analysts — they were expecting big growth, and the company had already guided to strong growth… it’s just that they did about 5-10% better than expected, depending on which metrics you use, and, as importantly, they raised their full-year forecasts. No matter what market you’re in, a “beat and raise” quarter is going to get investors excited, and in this market of growth enthusiasm it’s perhaps stronger than usual… so the stock opened almost 20% higher on Thursday morning. The financials point to the risk of a letdown in their second quarter, which ends July, mostly because the comparable year-ago quarter was the major beneficiary of the fidget spinner craze so the comps are challenging, so it might be that we’ll see the shares come back off of these highs a bit — but the company is doing everything right and I remain very impressed with their growth strategy and their ability to bring new stores into the fold so quickly and remain so nimble with fads and fashions. Next quarter’s results will probably depend on whether or not their summer-themed sales take off, with giant beach umbrellas and emoji towels and whatever else, so it’s possible that we’ll see some dips, but I think this one is worth holding even at these much-higher prices — a regional store going national can be a phenomenal investment if they can open new stores with relatively small capital investments and make them profitable quickly, and FIVE is getting it right. You can see the conference call transcript here to get an idea of what management is focused on. This is certainly not a cheap stock — with expected earnings of about $2.45 (that’s the middle of the company’s forecasted range), it trades at about 40X current-year earnings — so it’s not one that I’d want to be the largest position in my portfolio, but the growth potential is very strong and they’re building at a speed that would have them almost doubling the store count in the next five years, and that would still have them well below their potential market of 2,500 stores. So in some ways this stock price surge is just a validation that Wall Street believes them now. That won’t necessarily stick, you never know — but if they can get through another good year of merchandising, it could be a fantastic year for the company… they are guiding to just 1-2% comparable store sales growth and almost 20% sales growth overall, with impressive discipline in keeping costs under control as they expand, but they’re still fashion-driven and hit-driven. That means if they have another “fidget spinner” quarter this year they’ll blow out those numbers and the stock could soar, if they have a flop in the fourth quarter and don’t have good holiday sales, the stock could get cut almost in half (about half of their earnings come in the fourth quarter, like most retailers). So… fingers crossed. I expect to see the 2020 earnings estimates (that’s their next fiscal year, ending in January of 2020) rise into the fall, probably by about 10%, and that will mean the stock at $99 would be trading at roughly 30X forward earnings. That’s reasonable for this kind of growth, but the stock is also volatile around earnings and general sentiment about retail stocks (which has become strong again recently) so it’s quite likely that we’ll see the shares dip to more appealing prices along the way, too. If I didn’t own, I’d think about a first nibble in the low $90s if it dribbles back down to that point. It hasn’t yet gotten below $97 or so following the last earnings report, but the market is certainly volatile these days so it’s hard to guess what the next two weeks will be like — they should report their next quarter around August 30. Over to you, friends — it’s scary to ride a teen-driven fashion story like FIVE, but the store count and same-store-sales growth numbers convinced me. Is it enough to catch your fancy, or is the hefty valuation too much for you? Think they’ll see analyst upgrades in this lower-tax regime, or do you think it’s already baked in? Let us know with a comment below. Disclosure: I sold those call options a while back, but still hold shares of Five Below, and I also own shares of Amazon. 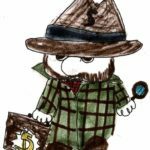 I will not trade in the stock for at least three days per Stock Gumshoe’s trading rules. 26 Comments on "Cabot’s “Next Amazon” Pitch"
Hi Travis, I’m still having trouble logging in. I cleared my cookies, etc as you suggested but it didn’t work. Any further suggestions? It should be working, it’s not usually the cookies that interfere in this way but the cache files in your browser — another way to check this is by using a private browsing window (Safari, Firefox) or incognito window (Chrome), that should also work because it ignores your cached files. If a private browsing window works, then there’s still something irritating in your cache, sometimes you’ll need to clear the cache more than once (particularly if you clear it while you still have a bunch of windows open). Hope that helps. Drop a line to payments@stockgumshoe.com if it doesn’t, please. I am having a similar problem logging in. I hti the login tab and the screen flashes and i am still not logged in to see the Irregulars Quick Take. Some times I click on another link and it links in but the Login button has not worked for several weeks. Should be the same issue with browser caching. Work around for me was to click on ‘signup’ and I was logged in. Thank you for addressing this.I have been having the same issue. Can’t even find a log in info box. Had been working seamlessly by just the login box on an lg V20. Works on Chrome. Doesn’t work on Internet Explorer, and Norton just cleaned the cache, which was loaded. Super curious to see what $FIVE $options end up in the Real Money portfolio upon next update, I think that’d be the way I’d approach taking a position. I am wondering if five pays a dividend. I found the symbol but I don’t see anything about dividend. Sorry, off the “Panther’s” topic: I’ve tonight been exposed to Roger Scott’s Market Geeks Titan system for which he has a discounted $997 entrevous…..I’ve not seen any Market Geeks info here @ Gumshoevia…..any knowledge out there?? I am too posting off topic and hope I don’t get in trouble. I have once again bought MAIN stock. I want to buy more and it was suggested to do it with options. I have never done anything with options so I am leary. What I was told if it goes south for me I wanted to buy the stock anyway and it is way cheaper than buying via market. Can someone please tell me if I am on the right path here or is it just junk help I received? Thank you for your help in advance. I just called my 28 year old daughter who does tons of shopping for clothes and other things as well. We live in Omaha and she has never even heard of this company called Five Below. So for whatever thats worth to you I would venture a guess that this company atleast at this point is somewhat of a unknown company amongst most people. That’s mostly what I like, the growth potential of the national expansion — I don’t think they’ve made it to Nebraska yet, the biggest concentration is on the East coast (they started in Philadelphia) and they’ve pretty recently been expanding in Texas in California. They are “fashion” but not so much clothes (though that’s a part of it) — more trends and fads and cheap electronics and housewares, I’d say. My son and daughter work for five below in Altoona Pa. It really gets busy. Hope this helps in some way. Any chance you will be looking at the five stocks mentioned in the Casey Research Marijuana Millionaire Summit? When you start getting the pitch for three 5G stocks, these are Verizon, Ceragon, and Zao. When I first saw the article a few months ago I bought Verizon then added on weakness. As an income stock it makes sense to me. The other two went up a bit from May this year, then encountered some weakness. Now that 5G is nearer they are starting to look more interesting. Don’t forget NOK (Nokia) in your 5G stocks. That’s because I’m long NOK. I think Tmobile (Tmus) as well, on dip, is a great long position. Are you allowed to solicit this group? This one I’m bitting my Five fingers. I always underestimate the shopping rage of the American consumer. It was a reco from Cabot at least 3 years ago but I thought; no way, how can they make money? 81 times faster than Amazon. No way in hell. what is the stock symbol for five below? 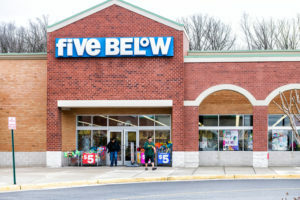 FIVE is the stock symbol for Five Below, 4lllls.